General Research Interests We study the ecology and evolution of animal behavior. We are specifically interested in predator-prey interactions, the sensory and cognitive ecology of foraging, and the effect of eavesdroppers on the evolution of the mating signals of their prey. These studies allow us to examine how an animal’s sensory and cognitive abilities influence how it makes a living in the wild, how it exploits the behavior of other species to do so, and how the dynamics of predator-prey interactions evolve. Animals use a wide array of cues to glean information about their environment. The details of an animal’s sensory and perceptual systems define the animal’s Umwelt. 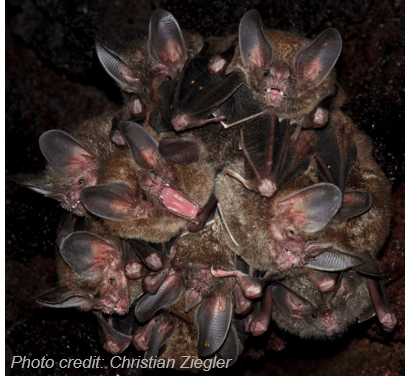 Our research investigates how bats integrate diverse sensory modalities to exploit prey-generated acoustic cues, echolocation cues, and chemical cues in foraging. 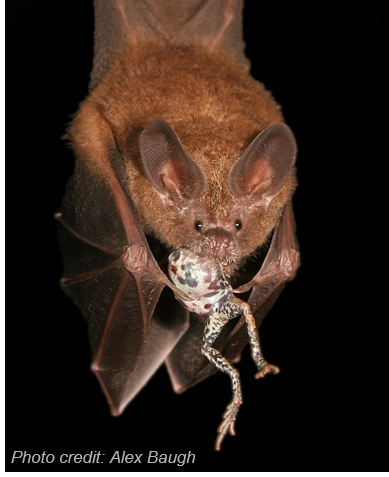 We have studied these questions extensively in the frog-eating bat, Trachops cirrhosus, a predator that eavesdrops on the mating signals of its anuran prey. The acquisition, retention, and retrieval of information is critical to foraging success. Our experiments investigate cognitive flexibility, social learning, and memory in predator foraging behavior. We have shown that bats can rapidly alter prey-cue/prey-quality associations in response to variation in foraging success, and that forging information can be quickly spread from bat to bat via cultural transmission. We are particularly interested in the tradeoffs associated with cognitive flexibility, and the degree to which social learning affects foraging dynamics in the wild. Eavesdroppers play a critical role in the evolution the advertisement signals of their prey. 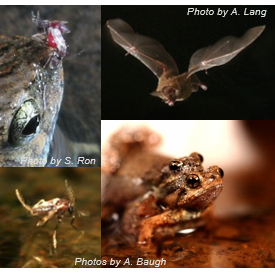 Collaborations with Ximena Bernal, Mike Ryan, and Ryan Taylor investigate the evolution of complex acoustic vocalizations by the male túngara frog, Physalaemus pustulosus. We are interested in quantifying the opposing selection pressures imposed by female túngara frogs, acoustically-orienting blood-sucking flies, and frog-eating bats on the evolution of the frog mating signal. These studies shed light on the roles of predators and parasites play in complex communication networks.